The Sublime Media Connection has been putting Brazilian Peel to the test. You can find several of the reviews here. Brazilian Peel was awarded the Allure 2010 Best of Beauty, Best Beauty Breakthrough Award. It has been featured on Dr. Oz (twice) and The Doctors (once). 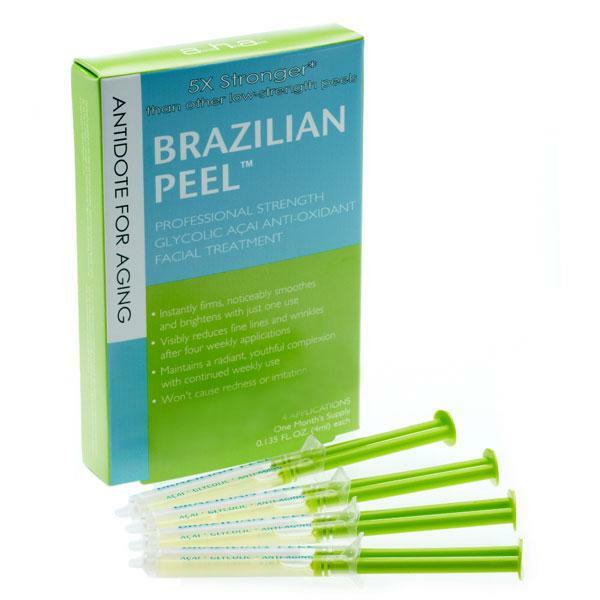 Brazilian Peel is the first 30% glycolic acid, medical strength peel for at-home use. 5x stronger than other retail products, this unique new Brazilian style peel is clinically proven to visibly brighten, smooth, firm and tone skin for a more youthful appearance. All the benefits of a professional peel in an easy do-it-yourself treatment. The Brazilian Peel contains glycolic acid and açai, a natural super anti-oxidant from the Amazon rain forest in Brazil. It is ‘red carpet ready”, it will not cause redness or peeling and is dermatologist tested to be safe and non-irritating. Research Results: – 100% of the evaluable subjects had improvements in skin brightness in at least one area of the face, as graded by the investigating dermatologist – At least 70% of the subjects found their skin to be softer and smoother – At least 70% of the subjects had increased facial brightness – At least 70% of the subjects found their skin to feel firmer and more toned. Brazilian Peel is formulated without: Parabens, Sulfates, Synthetic Fragrances, Synthetic Dyes, Petrochemicals, Phthalates, GMOs and Triclosan. 3 very lucky readers are going to win a month supply of Brazilian Peel, valued at $78. This giveaway begins on July 30 and ends on 8/30.